Please do NOT download the kext! This version may hang your system! Will update the kext when I located the problem. A new updated version of AppleIntelCPUPowerManagementInfo.kext is now available for download. I have personally run it on a Sandy Bridge and Haswell configuration and there was no KP. Please try this version and let me know if it works on your hack. Thanks! Update: The latest version of AppleIntelCPUPowerManagementInfo.kext lets you disable features from the Info.plist See Update-2 below for more info. And yes indeed. This shows you that all processor cores have reached the available C-States. Which is good news. You may wonder why only MSR_PKG_C2_RESIDENCY is being used, but that is most likely something related to the IGPU drivers/settings and I was unable to solve this today (sorry, this was all I could do today). I’d say that is pretty impressive, but this is (currently) only possible with the next update of AppleIntelCPUPowerManagement.kext… if we manage to get it going on a wider range of processor models. This is why your support is so important to us, so please help us validate the kext and data for you processor model. Thank you! Note: logIGPU is disabled by default because it appears to trigger a KP on certain motherboards. Hopefully these people will help me to fix this problem. Thanks! Package C6 state is the deepest C-state supported on discrete graphics systems with PCI Express Graphics (PEG). Package C7 state is the deepest C-state supported on integrated graphics systems (or switchable graphics systems during integrated graphics mode). However, in most configurations, package C6 will be more energy efficient than package C7 state. As a result, package C7 state residency is expected to be very low or zero in most scenarios where the display is enabled. Logic internal to the processor will determine whether package C6 or package C7 state is the most efficient. There is no need to make changes in BIOS or system software to prioritize package C6 state over package C7 state. Source: Intel datasheet 328897-001.pdf page 58. The number one reason for telling you this is that it enables you to check what ACPI Methods in the processor scopes are being called/evaluated. I did the same and here I only see the debug messages for the following ACPI Methods in the processor scopes: _INI, _PDC, APSS, ACST and _DSM. The latter of course only for CPU0 on Ivy Bridge and Haswell configurations, where we inject a ‘plugin-type’ property, set to 1, to trigger the load of the required plugins. And thus, all other methods in power management related ACPI tables is cruft and can be removed/forgotten. Oh and here is another tip. The output may scroll too fast, as it did here, but you can stop it by adding Sleep (10000) in the last Processor Scope. This way it waits for 10 seconds before continuing. I also use my iPhone/iPad to film the output. Note: I am aware of other tools that dump the debug messages, but I love to share anything that may help us. This may not be the best solution for you, but this is what I use today. Reboot and the debug output can be found in: /var/log/system.log or use: sudo dmesg | grep ACPI. log show --predicate 'process == "kernel"' --debug --last "5m"
This is everything that you need to do. Other serial numbers can be found here (scroll down to the bottom). Please note that it should begin with: FSKLT. This means that Apple will have to update the EFI firmware for other Mac models as well. Pretty soon I hope because that should help solving the error message. Edit: Mac-F60DEB81FF30ACF6.plist does not include FrequencyVectors data, but that appears to be required for Haswell processors. Using Mac-7DF21CB3ED6977E5.plist, or any of the other plist with FrequencyVectors data solved this problem. Edit: You can download and run freqVectorsEdit.sh to fix the above problem. Note: I used OS X 10.9.2 Build 13C32 for my testing! Which I extracted from the new Mac Pro firmware for you. Please report when this snippet works for you. Or not of course. Apple seeded the first test build of OS X 10.9.2 (13C32) to registered Mac developers, available through the Software Update mechanism in the Mac App Store as well as through the Mac Dev Center. AppleHDA is still working with my New style of AppleHDA.kext patching, even after being updated to version 2.6.0a12 so that is really good news. But no. I have not checked FaceTime audio. Not yet. And yes. 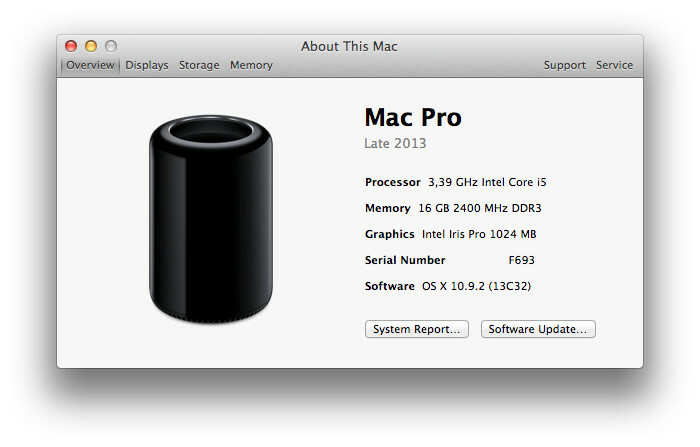 The Mac Pro images are now available. Finally. Look here. It also included the latest plist for the new Mac Pro, which I assume is something people using the new Mac Pro SMBIOS would want to have. But no. The About This Mac image is not included with these upgrades. People who want to install this update should use a SMBIOS from the late 2013 MacBookPro11,n which can be found here but please make a backup first! Before launching the installer. You know. Just in case you run into a problem. Also note that the installer will fail on Build 13A2093 and 13B3116 (as it should). p.s. Some people are looking for a combo update, but there is no combo update for the first update to OS X as there is nothing to put together (combine). Hi folks. The year 2013 is nearing the end and that, unfortenately, will also be the end of my involvement. The reason for this is simple; we’re going to have a baby in May (will post a card when our baby is born) but I still need to finish a home for our family. And this isn’t the only good news. Nope. The concrete slab is finaly ready for the next step, but it was a lot more expensive due to a hidden hole underneath our plot. Which was why it was so darn cheap I guess, but it also means that we now have to pay an extra/unplanned invoice. Think lots of overtime – hence me not having any free time left to play with hack related stuff.